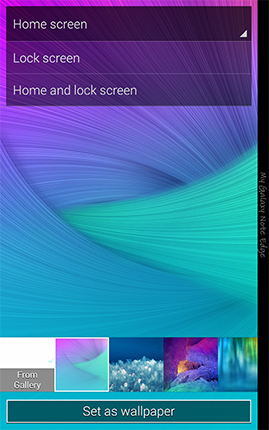 Note Edge: How can I change the wallpaper on my Samsung Galaxy Note Edge? Choose what you see on your device's Home screen (behind your shortcuts and widgets) and on the lock screen. 3. 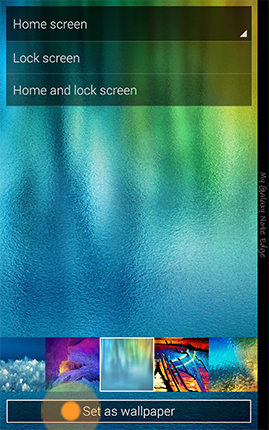 Select Home screen, Lock screen, or Home and lock screen. 4. 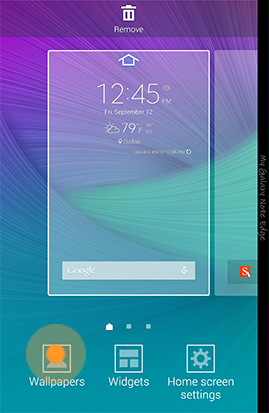 View preloaded wallpapers by swiping left or right at the bottom of the screen, and touch a thumbnail to enlarge it. 5. Touch Set as wallpaper to apply the selected wallpaper. • From Gallery: Select a wallpaper from pictures you have taken with your camera or uploaded to your device. • Live weather: Have your device display pictures on your lock screen based on your location and the weather. Touch Settings > Weather to change the Auto refresh interval. Mark the Wi-Fi® only checkbox to only download pictures when connected to a Wi-Fi source. • My interests: Have your device display pictures on your lock screen based on your interests. Choose from Drawings, Travel, Nature, Landscape, Night Sky, Pets, and Food. Note: Preloaded wallpaper cannot be deleted, but you can remove wallpaper you have downloaded. From the thumbnail scroll, touch and hold a thumbnail to select it. Then touch Delete .